Beall Concert Hall is located on the University of Oregon campus. With its warm acoustics and intimate feel, it is a perfect home for OMP's up-close and personal concerts. 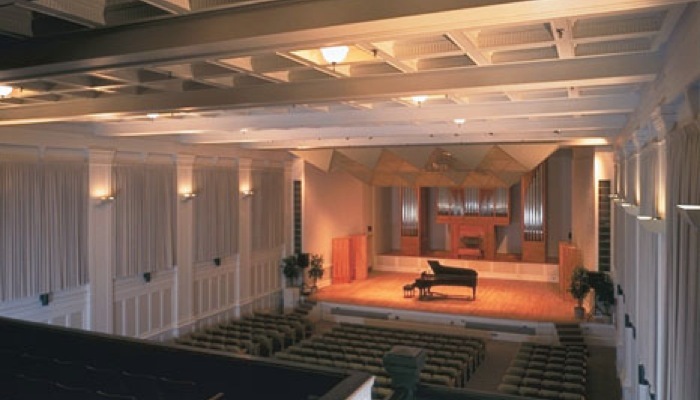 Beall is the performance venue for all season concerts except for the annual Candlelight Concert. Parking is available in University of Oregon Lots 19, 20, and 22, which are located just downhill from the concert hall. Parking in university lots is unrestricted on Saturday evenings and on Sundays, except for those spaces marked "Reserved at All Times." Access to all three lots is available from both Alder Street and 18th Avenue. Handicapped parking is available in all three lots. A parking map can be found here. Before OMP concerts, we present Key Notes, our pre-concert talk series, in University of Oregon School of Music and Dance Room 163, which is located adjacent to Beall Concert Hall. A map of the building can be found here. Key Notes begins at 6:45 p.m., and more information can be found on the OMP Concert Experience page. After the conclusion of performances in Beall Concert Hall, OMP hosts a post-concert reception in the Foo Lounge at the University of Oregon School of Music and Dance. Please reference the building map above. Located near the heart of downtown Eugene, First Christian Church is the performance venue for OMP's annual Candlelight Concerts. Especially when lit by candles, it provides a calming and inviting setting for the winter season. Parking: Please be advised that the surrounding lots on Willamette Street and Oak Street are paid parking lots managed by Diamond Parking. Metered street parking is also available near First Christian Church. Handicapped parking is available on the south side of the building facing Ta Ra Rin restaurant. All audience members attending this concert are seated in pews. Key Notes is hosted in the sanctuary at 6:45 p.m.
After the conclusion of Candlelight performances in First Christian Church, a reception featuring homemade holiday cookies is held in the sanctuary.